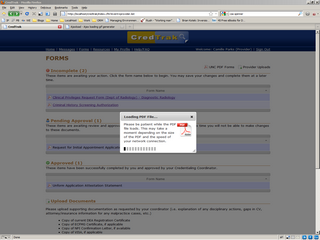 In my current project I am displaying large PDF forms to the user. Depending on the size of the form - it can take a moment or two for the PDF to load. 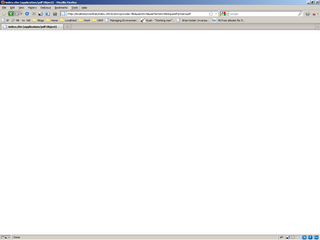 Instead of the user looking at a blank screen I created a small dialog using jQuery UI. 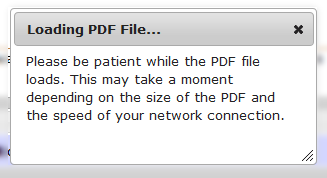 I wanted the dialog to display when the user clicked on the link to the PDF. To spruce things up I added a small PDF icon and 'spinner' graphic from AjaxLoad. Note: the spinner _isn't _tied to the load time but gives the impression to the user 'something' is happening. 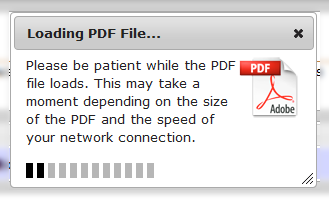 Now when the user clicks on a PDF link the dialog pops up and stays there until the PDF is loaded.